We all have our favourite dishes and that goes without saying. We're letting you in on a secret. -- Our best-sellers list is out, find out if your fave made it to the list! This 'cake in a jar' is truly a delectable dessert. It is carefully designed with layers of dark chocolate, crunchy nuts and dry fruit crumble. A melody of dark chocolate sprinkle is added to make it all the more indulgent. This dessert has won the hearts of many and is a stellar dish. FM Signature Roasted Chicken Caesar Salad - 152110 salad-smiles shared. Julius Caesar has nothing to do with this salad, really. Back in 1924, an Italian-American restaurateur called Caesar Cardin tossed up a salad with the ingredients in hand and served it at the restaurant he had set up in Tijuana, Mexico. The salad was a hit! Here’s our spin on the classic – lettuce, cucumber and sundried tomatoes tossed in a yummy yogurt-mayo dressing, served with the star of the salad: sliced, rosemary-infused, roasted chicken breast. Powerup Fruit Parfait (Veg) - 142199 brekkies made delightful. Craving for a snack-meal packed with nutrition? We've got something just for you. Indulge in the goodness of yogurt, freshly cut fruits and home-made crunchy muesli - all packed together to give you that energy kick, at any time of the day! With a combination of crunchy cashews, peanuts, cranberries, roasted sunflower seeds, pumpkin seeds and sultana raisins – go nuts on our nutty trail mix, the healthiest snack you could ask for! Teriyaki Chicken Hot Pot - 115288 bowls of goodness served. The mighty Shoguns of Tokugawa family, who ruled Japan in the 1600s, are credited for developing teriyaki, a cooking method whose result is stunningly dark, caramelized meat. 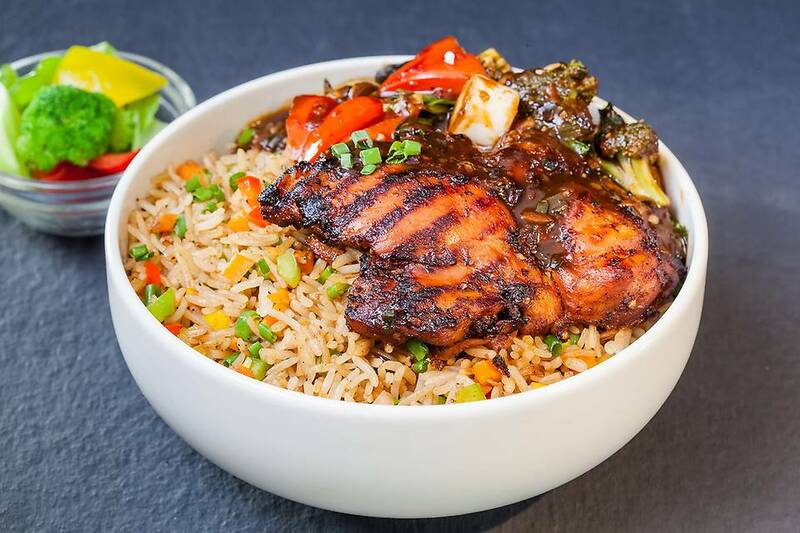 Our Teriyaki Chicken Rice Bowl is an enticing meal you’ll easily surrender to. You’ll see! Teriyaki sauce and rice-wine vinegar infused, grilled chicken steak is served with leeks, broccoli, mushroom, bell pepper, carrot and Chinese cabbage seasoned, sautéed and simmered in a rice-wine vinegar infused teriyaki sauce, for you to do the honours… go ahead, gobble it up with a portion of the spicy chilli-garlic fried rice. May contain mushroom. No added MSG. Find out why they are the most loved dishes! Check out FreshMenu.com and order them in today! A happy tummy is a happy you!